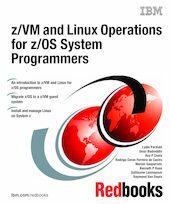 This IBM Redbooks publication discusses z/VM and Linux operations from the perspective of the z/OS programmer or system programmer. Although other books have been written about many of these topics, this book gives enough information about each topic to describe z/VM and Linux on IBM System z operations to somebody who is new to both environments. This book is intended for z/OS programmers and system programmers who are transitioning to the z/VM and Linux on System z environments and who want a translation guide for assistance. We base this book on our experiences using System z10 Enterprise Edition, z/VM version 5.3 RSU 0701, and Novell SUSE Linux Enterprise Server (SLES) 10 on System z. Chapter 1. Why z/VM and Linux for System z?